My son is so incredibly hungry when he comes home from school. He spends the time from when he gets home from school until dinner time eating every piece of fruit he can find in the house. I love that he eats so much fruit, but sometimes I just want to have a snack for him with a little more fat that can keep him satisfied until dinner, especially when we have other things to do after school. So earlier this week I made one of my favorite party appetizers for him as a make-ahead after-school snack. These little cream cheese bites have always been one of my favorite appetizer foods, but I don’t make them nearly often enough at home. Since my son loves these too. So I thought to make a bunch of them early in the week, and then I separate them in small storage containers. This makes a great idea for a hearty kid-friendly snack. 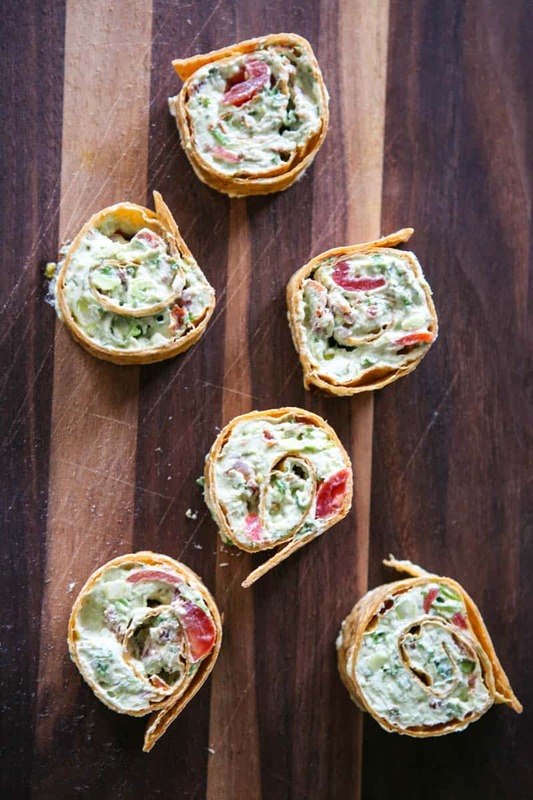 These little snack roll-ups are loaded with flavor too. I added a whole avocado, bacon, tomato and fresh cilantro. I also added some spring onions and a bit of cumin. 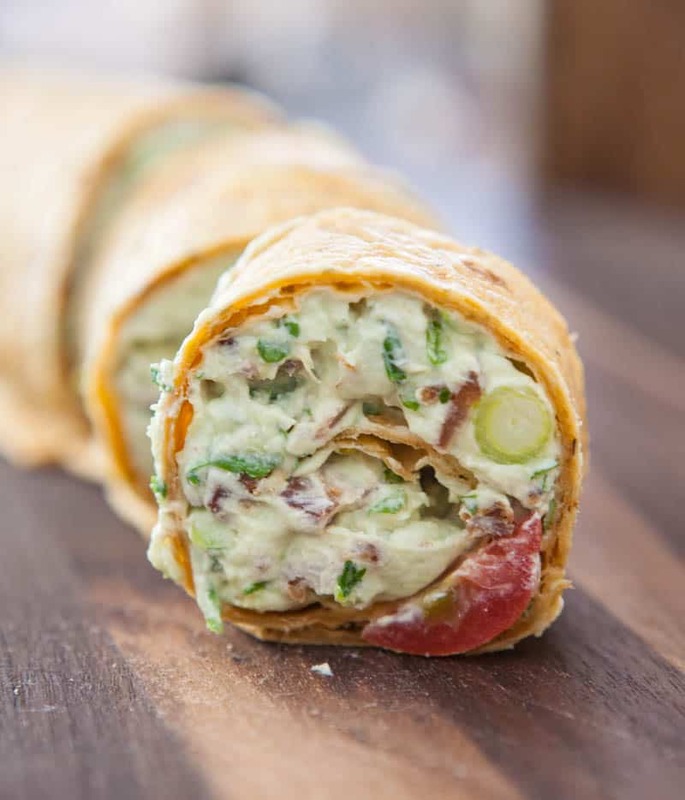 These taste pretty much like a southwest inspired BLT, but in wrap form! The one thing I love about these is that you can add any veggie you like to the cream cheese, omit the bacon, and add any type of fresh herb. There’s so many possibilities. This recipe makes two large tortillas that you roll up and slice up. There’s at least 6 servings, depending on how much your kid eats. I split these little rolls up in separate small storage containers, so they’re super easy to hand to my son after school. These are perfect to pack in his lunch, or to take in the car for a snack. 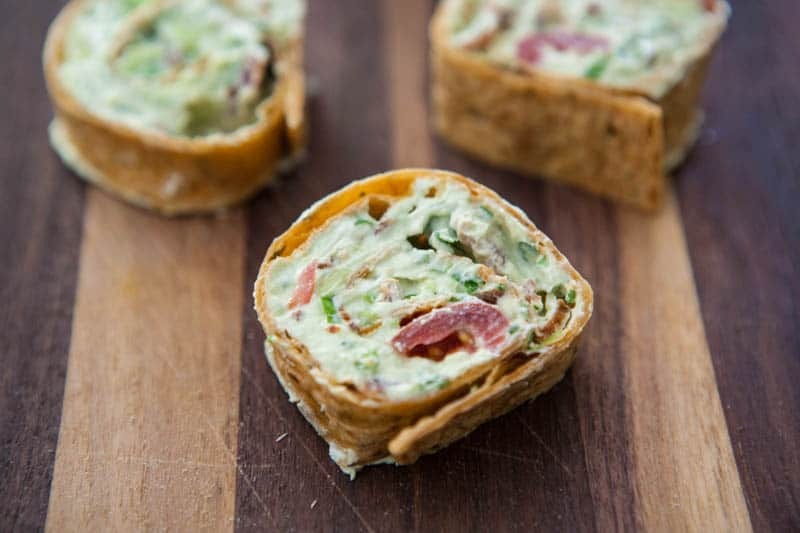 In a large bowl, combine cream cheese, avocado, green onion, bacon, cilantro, cumin and lime juice. Mix well to combine. Spread mixture evenly over two large tortillas and roll up. Cut in slices and place on plate. Refrigerate until ready to serve. NFRA is a non-profit trade association representing all segments of the frozen and refrigerated dairy foods industry, including distributors, logistics providers, manufacturers, retailers/wholesalers and suppliers. Headquartered in Harrisburg, PA, NFRA is the sponsor of March National Frozen Food Month, June Dairy Month, June/July Ice Cream & Novelties promotion and October Cool Food for Kids educational outreach program. NFRA provides consumer information such as food safety guidelines, meal preparation tips, recipes and sweepstakes opportunities at EasyHomeMeals.com. For additional information on NFRA or to find recipes or tips, visit NFRAweb.org or EasyHomeMeals.com. My kids are CRAZEEE hungry when they get home from school. They’d love this! Whoa! These rolls up look delicious! Perfect snack! These look perfect for lunch! My kids go crazy for food after school too. Great! I’d cook it and posting the recipe on my blog! Adding a little organic chicken and it would be a good lunch wrap. I made these for an appetizer for a Mother’s Day weekend and everyone LOVED these. YUM-O. I pinned your avocado etc wrap and everyone has picked it up. Can’t wait to get to the grocery to get everything to make this. I’m just finding this on pinterest. I’m curious as to how the avocado holds up for subsequent days. I’ve never commented on the internet, but this recipe was TOO GOOD. I added another avocado, doubled the bacon and added one jalapeno, seeds and all. My husband and I are DYING!! This is amazing. Thanks for the recipe! Give him a big glass of water with his snack. Most people run around chronically dehydrated, and can’t tell the difference between thirst and hunger. This looks so delicious! I just have to try it-but on Toast! Looks and sounds great! Yummy!